This paper presents evidence of a non-linear relationship between real GDP growth and oil price changes for the US economy. We also argue that this non-linearity is not merely due to the use of data from the mid-1980s onwards, as most authors, so far, seem to believe. In fact, we find the existence of non-linearity with the use of data earlier than 1984, and even before 1977. Furthermore, we question that the non-linear transformations of oil prices proposed in the literature are the most appropriate ones for reflecting such non-linearity. During periods of market stress, electricity prices can rise dramatically. This paper treats these abnormal episodes or price spikes as count events and attempts to build a model of the spiking process. By contrast to the existing literature, which either ignores temporal dependence in the spiking process or attempts to model the dependence solely in terms of deterministic variables (like seasonal and day of the week effects), this paper argues that persistence in the spiking process is an important factor in building an effective model. A Poisson autoregressive framework is proposed in which price spikes occur as a result of the latent arrival and survival of system stresses. This formulation captures the salient features of the process adequately, and yields forecasts of price spikes that are superior to those obtained from na�ve models that do not account for persistence in the spiking process. 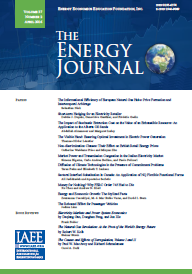 This paper explores the links between oil prices and inflation in the euro area by means of a DSGE model reflecting the structure of the energy markets in the euro area and calibrated to match the data using reduced-form time series techniques. The analysis focuses on the impact on inflation (through the Harmonised Index of Consumer Prices (HICP) and its energy component) in the short and medium run. The main conclusion is that, in the short term, changes in oil prices are of vital importance for the understanding of inflation, but that at longer horizons their impact on inflation is much more complex and depends on the initial shock. An analysis of the sources of oil price increases remains therefore a pre-requisite for a proper understanding of historical fluctuations of oil prices and the related developments in the euro area, and for drawing policy conclusions. This paper uses prices that were directly observed at 27 gasoline stations in Guelph, Ontario, eight times per day for 103 days in late-2005, to examine several basic predictions of a theory of price cycles. It is found that price movements in Guelph are more consistent with the Edgeworth cycle theory than with other dynamic pricing theories. The data also identify some interesting (and somewhat systematic) pricing patterns that have not been identified in previous studies, and which would likely be overlooked with less complete data. These findings are not only of interest to applied economists and policymakers, but also to theoreticians who are interested in refining the theory to make more accurate predictions. This paper examines oil sands royalty and tax systems that have either been proposed or implemented since the mid-1990s. Simulation models of oil sands production projects are constructed and the distribution of ex ante economic rents for various assumed crude oil price paths is calculated. The results suggest that until 2007 changes in royalties and taxes had been favorable to producers. The pattern of estimated real internal rates of return obtained through the simulations supports this conclusion. The recommendations of the provincially appointed Royalty Review Panel were anchored in the view that Alberta�s oil sands industry had matured since the mid-1990s and that a distribution of ex ante rents more favorable to Albertans, as owners of the resource, was thus warranted. In contrast, the changes proposed by the Government of Alberta in 2007 would effectively return the distribution of ex ante rents to what prevailed a decade earlier. However, the role of royalties (as opposed to corporate income tax) as means of capturing rents for governments is more important under the proposals made in 2007.